Provide comfort for the family of Melvin "Don" Hosey with a meaningful gesture of sympathy. Mr. Melvin Hosey, age 89, of Coopersville (formerly of Vermontville) passed away Friday, January 25th, 2019 at Metron of Lamont, , MI. Melvin was born at home in Vermontville, MI on December 8, 1929, the son of the late Melvin and Mary (Halsey) Hosey. He was raised in the Vermontville area and attended local schools. On November 1, 1949 Melvin joined the United State Navy and completed his education during his active duty. 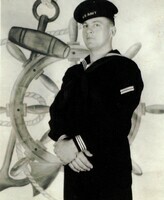 While serving his country Melvin received the National Defense Medal, and was trained in Submarine Operations. Melvin was married to Norma Jean (Parisian) Hosey on May 4, 1954. They made their home together on their Vermontville farm raising their two dauthers and 3 sons. After Norma passed away in 1985, Melvin was married to Harlean (Purdy) Hosey. Melvin & Harlean made their home together in the coopersville as Melvin worked as a machine repairman for General Motors in Grand Rapids. The couple has celebrated of 30 years of marriage. Funeral Services will be held at The Daniels Funeral Home, Nashville, MI, at 1 PM on Thursday, January 31st, with Pastor Joe Benedict officiating. The family will receive visitors two hours prior to the funeral service on Thursday beginning at 11 AM at The Daniels Funeral Home in Nashville. There will a time of fellowship and luncheon immediately following the funeral service at the Vermontville Bible Church in Vermontville, MI. Memorial contributions can be made to the family of Melvin Hosey. The family will receive visitors 2 hours prior to the funeral service. We encourage you to share your most beloved memories of Melvin "Don" here, so that the family and other loved ones can always see it. You can upload cherished photographs, or share your favorite stories, and can even comment on those shared by others. Provide comfort for the family of Melvin "Don" Hosey by sending flowers. Dearest Teresa and your loved one's....Larry and I want to send our caring thoughts and prayers your way in the lose of your father...God Bless and be with you all at your time of sadness.